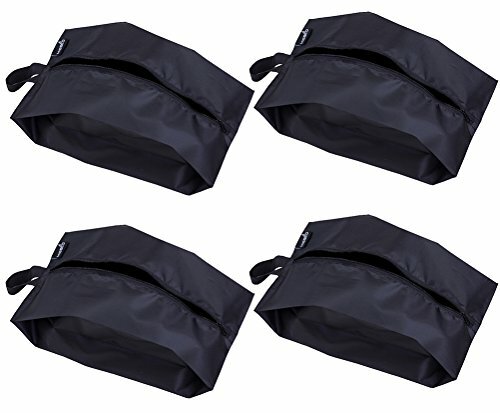 Set of 4. travel shoe bags large enough to holds women size 10, like lady chunky High heels, sneakers, trainer, casual shoes, etc. or mens 13US slippers, golf shoes. Lifetime guarantee: at least 90 days warranty, any problem, welcome to contact with our customer service, we would like to do our best to make it right for you. Nylon fabric, lightweight with zipper closure, zips up smoothly and protect your shoes dust free in trip, gym or closet. Works well as a shoe storage bag to keep your shoes separate from clothes and in great condition while traveling. Size (L x W x H): 15 inch * 9.8 inch * 4.3 inch. Ideal for packing dance shoes, kids shoes, flip flops, sneakers, hiking tennis golf shoes in your luggage.